From translating the patient's medical records and test results to providing recommendations, the neuropsychological evaluation incorporates the science and practice of neuropsychology, neurology, and psychological sciences. The Little Black Book of Neuropsychology brings the practice and study of neuropsychology into concise step-by-step focus-without skimping on scientific quality. This one-of-a-kind assessment reference complements standard textbooks by outlining signs, symptoms, and complaints according to neuropsychological domain (such as memory, language, or executive function), with descriptions of possible deficits involved, inpatient and outpatient assessment methods, and possible etiologies. Concise framework for understanding the neuropsychological referral. Symptoms/syndromes presented in a handy outline format, with dozens of charts and tables. Review of basic neurobehavioral examination procedure. Attention to professional issues, including advances in psychometrics and diagnoses, including tables for reliable change for many commonly used tests. Special "Writing Reports like You Mean It" section and guidelines for answering referral questions. Includes appendices of practical information, including neuropsychological formulary. 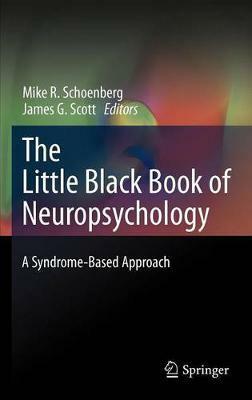 The Little Black Book of Neuropsychology is an indispensable resource for the range of practitioners and scientists interested in brain-behavior relationships. Particular emphasis is provided for trainees in neuropsychology and neuropsychologists. However, the easy to use format and concise presentation is likely to be of particular value to interns, residents, and fellows studying neurology, neurological surgery, psychiatry, and nurses. Finally, teachers of neuropsychological and neurological assessment may also find this book useful as a classroom text. "There is no other book in the field that covers the scope of material that is inside this comprehensive text. The work might be best summed up as being a clinical neuropsychology postdoctoral residency in a book, with the most up to date information available, so that it is also an indispensible book for practicing neuropsychologists in addition to students and residents...There is really no book like this available today. It skillfully brings together the most important foundationsof clinical neuropsychology with the 'nuts and bolts' of every facet of assessment. It also reminds the more weathered neuropsychologists among us of the essential value of neuropsychological assessment...the impact of the disease on the patient's cognitive functioning and behavior may only be objectively quantified through a neuropsychological assessment." Illustrations note XVIII, 968 p.
Concise framework for understanding the neuropsychological referral. Symptoms/syndromes presented in a handy outline format, with dozens of charts and tables. Review of basic neurobehavioral examination procedure. Attention to professional issues, including advances in psychometrics and diagnoses, including tables for reliable change for many commonly used tests. Special "Writing Reports Like You Mean It" section and guidelines for answering referral questions. Includes appendices of practical information, including neuropsychological formulary. ..".The authors have truly reachd their goal of making this book useful for a wide variety of professionals at different stages in their career. In relation to neuropsychologists there is something for everyone, from the graduate student, to the clinician studying for the ABPP/ABCN examination, to the seasoned professional who is seeking out a good refresher on various topics pertinent to neuropsychology. With the wealth of information it provides, the title of this book, The Little Black Book of Neuropsychology seems almost an oxymoron, as the information it offers is anything but little." Part I: Neuropsychology - General Issues: The Neuropsychological Referral.- Medical Records.- Basic Neuroanatomy.- Basic components of a Neuropsychological Evaluation.- Part II: Neuropsychological Domains: Arousal: The drowsy, lethargic, or stuporous patient.- Attention/Concentration Problems: The distractible patient.- Inattention/Neglect Syndromes.- Language Problems.- Learning and Memory: The Forgetful Patient.- Visuospatial/Visuoconstructional Problems.- Apraxias.- Agnosias.- Executive Functions (problem solving, abstraction, sequencing, inhibition, self-monitoring, planning, and initiation).- Emotional/Mood.- Episodic Neurological Dysfunction.- Part III: Specific Neurological Diseases: Aphasia.- Cerebrovascular Disease and Stroke.- Dementia.- Seizures/Epilepsy.- Somatization Disorders, blackout spells, fits/convulsions.- Parkinson's Disease and other movement disorders.- Multiple Sclerosis and Other Demyelinating Disorders.- Traumatic Brain Injury and Concussion.- Infections.- Neoplasms/Neoplastic Syndromes .- Psychiatric - depression and anxiety.- Part IV: Special Considerations: Medicolegal exposure.- Reporting Test performance/scores.- Limitations.- Answering Referral Questions.- Placement issues. Mike R. Schoenberg, Ph.D., is an Assistant Professor of Neurology at University Hospitals of Cleveland and Case Western Reserve University School of Medicine. He completed a two year post-doctoral fellowship in clinical neuropsychology at the University of Oklahoma Health Sciences Center and an internship at the University of Kansas School of Medicine, Wichita. He provides academic instruction and supervision in clinical neuropsychology to medical students and psychology trainees, and conducts research in clinical neuropsychology. James G. Scott, Ph.D., ABPP-Cn is a Professor of Psychiatry at the University of Oklahoma Health Sciences Center. He completed two years of postdoctoral training in clinical neuropsychology at the University of Oklahoma Health Sciences Center and an internship at Tulane University Medical School. He is board certified by the American Board of Professional Psychology in clinical neuropsychology and provides academic instruction and supervision to medical students and psychology trainees in clinical neuropsychology and conducts research in clinical neuropsychology.